Spiegeltents were popular venues in Belgium between 1908 and 1940. After the second world war dancing to waltzes and polkas to organ music had passed in fashion and the world danced to a different tune. In 1981 I purchased The Danspaleis, a spiegeltent dating from 1908. At this time I had two different dance bands and the Danspaleis seemed to offer a captivating ambiance including offering a perfect dance floor. Others in the entertainment arena began to see the possibilities that spiegeltents offered as venues full of charm and atmosphere. Festival organisers saw them as a focal point for festivals, a place where audiences, artists, producers, in fact everyone involved could mingle, perform, flirt, dance and drink. Although basically designed as a dancehall they offered a perfect stage for cabaret, vaudeville, comedy etc. As a theatre, it was never easy to please everyone. Sometimes the stage was too small, pillars blocking the view or too many chairs making it difficult for the audience to move around. It was hard to find spots for the lights, cables and all within prescribed modern safety standards without detracting from the glorious, magical interiors of the tents. 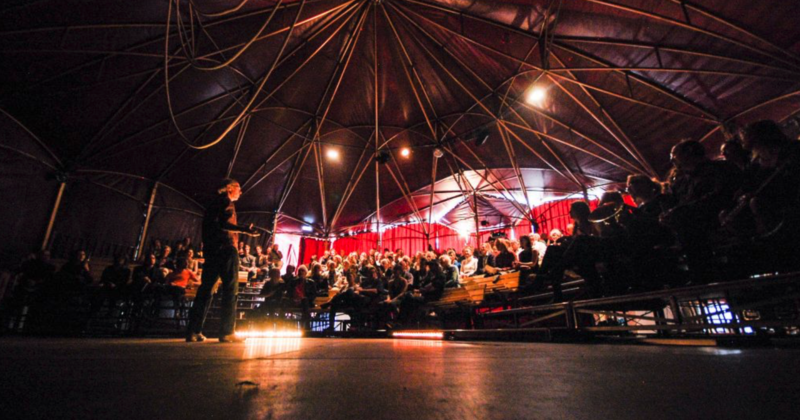 Having travelled with the Danspaleis throughout Europe, North America, New Zealand and Australia and witnessing many organisations trying their best to use them as theatres, I conceived the idea of buying the Bosco theatre. The Bosco is a small Dutch circus tent from 1910 which I restored especially for the use as a theatre. The Bosco theatre has been successful from it's debut, throughout Germany, The Netherlands, Scotland, Ireland, has been to Australia for many years and now is very popular in the UK. ​This success inspired me to start dreaming of my own design, creating a new mobile theatre. I wanted to incorporate my experience with all the ideas of both modern and historic techniques of tent building. A venue that offered an intimate atmosphere with comfortable seats for an audience of about 320 people. A wide stage providing all the facilities that a theatre needs these days. A structure with style, ambience, a real theatre, a place that is unlike any other tent or mobile hall, because it is purposely designed as a theatre. A place where we experience a different world upon passing through the vestibule we leave the outside world behind. My new theatre is called the “Corona” due to the shape of its roof. I have combined all my knowledge, love and dreams to create an entity that both performers, audiences, producers etc will be enchanted with. The Corona deserves to be considered for your next festival so you can see for yourself how quickly it builds, how enticing it looks and how fast it disappears until it appears the next year. Restoring and utilising two tents of 100 years old over a period of 30 years, has enabled me to understand the logic and skills of these tent builders. The origins of the Bosco theatre and the Danspaleis are not so much the circus rather the fair. Mobile structures that could be built by a few workers on a marketplace or a square. Constructed of parts that were easy to handle by one or two persons. Lightweight, strong and durable parts that would fit together in no time and did not require bolts or screws. Parts that were easy to repair and replace, fitting together to create a structure that did not need anchoring and is stable in the face of wind or rain. A structure with richly painted facades, portraying amazing experiences within luxurious interiors, often imitating the venues of the rich and famous. A venue where you could forget the outside world for an hour or two. In a world where it is rare to see a craftsman working without the help of powered tools, it offers a window back to the past. This way of working has become unique in today's fast paced world. Working this way is a pleasure, it eliminates noise, so we can communicate easily, even sing as we work. It is never monotonous and offers a quick result and satisfaction at day's end. Also in an era where the demands on architecture are changing rapidly, mobile structures are gaining in value and popularity. Already in recent architecture we see a trend to look at the recyclability of materials. Recently there has been a general interest into the temporary architecture from the “tipi” of the American Indian to the Mongolian “yurt”. All these facts have contributed to the success of my tents. Spiegeltents have been built anew for many years and their number is on the increase due to their worldwide success. These new tents are mostly aluminium structures that are fast to build, but tend to be without character or ambience. Always imitations of structures that we are familiar with in brick and concrete. Their task is mainly seen as temporary replacement of a genuine building and their features are mainly plain and uninteresting. My experience with the Bosco theatre and the Danspaleis along with the many mobile structures I have seen and built with colleagues all over the world has convinced me of the value and the joy of these structures. It is of importance to conserve, adapt and evolve this tradition in the future. These tents represent a romanticism and nostalgia of a past age that people instinctively understand.